I recently read the new book by Senator Ben Sasse, “THEM: Why We Hate Each Other—and How to Heal”. I was struck by how much I could relate to his findings and analysis. While he declares “We’re literally dying of despair”, there are hopeful solutions. “The same technology that has liberated us from so much inconvenience and drudgery has also unmoored us from the things that anchor our identity,” says Sasse. In almost everything I do, say, or write, I have the rising generation in the forefront of my mind and heart. However, this idea that loneliness and despair are killing us, hits all generations square on. I am fortunate to live in a pretty nice area of the world, in a very comfortable home, surrounded by many good people, and have a loving family. Truth be known, many in my neighborhood, including my wife and I, find that loneliness is too often our companion. There are always activities to partake in, but so much of these are just crack the surface and don’t really provide relationships that take the husks off the corn. Loneliness of course leads to anxiety and depression or a combination thereof. Its causes can be triggered by a variety of events or changes in life’s circumstances. Contemplating these truths, the invitation from some spiritual leaders to folks old and young to partake in a social media fast for a week or so, is more than timely and ironic—-it is a part of a cure to the despair that ales us. 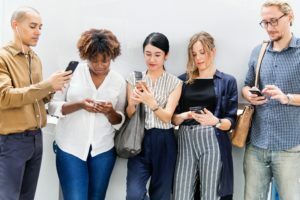 Unmooring us from social media addiction (whether you admit to being owned by the digital world or not) actually does move us dramatically closer to discovering our true identity and this discovery is key to leaving the dumpsters of despair. Contributing to this social media conundrum and the current state of our loneliness is the inability to find meaning in one’s life. So many factors contribute to loneliness and much of it has rolled upon us like a silent tsunami. Perhaps like a tsunami, it was caused by the breaking of the earth far below the surface; but the effects, now in play, cannot be avoided. The underlying movement which cause despair are varied and many. Walking from the dark halls of loneliness and despair into hope and sunlight we are challenged with opposition from the highly digital world which has engulfed us. And yet, there are simple yet practical solutions to move toward hope and joy. Meditate upon the following few items and contemplate whether in your life they represent underlying movements that are causing tsunamis of despair and loneliness. Recognizing these underwater movements may help us avoid the waves that are coming; or at lease take us to higher ground. Detach: Get off the hamster wheel. Test the invitation to partake in a social media fast—to whatever extend you can—and see if this helps focus the mind and settle the soul. I suggest it will give you a fresh set of eyes from which to view yourself and the world you live in. Discover “callings” in your life that bless the lives of others. Finding purpose in life is the absolute best remedy for loneliness. A calling is a passion you have personally adopted or feel called to. It can represent many things—but always involves blessing the lives of others. Key to this calling is passion. If you love the cause, you will love the time you devote to it. Discover your true identity; which will shape your view of the world in a way that allows hope to rise above despair and loneliness. We talk much about this path in Launching Leaders: An Empowering Journey for a New Generation. Find the divinity within you and see how knowing deeply who you are, changes everything. The world we live in has changed dramatically. We can also change in ways that will allow us to connect with family, friends, and the world in more personal and holistic ways. Hugs are better than “likes” and building relationships face to face are significant vs an electronic friend. Figuring out how to settle the deep underlying movements, will bring us peace and reduce our despair and loneliness. Since there is not a living soul untouched by loneliness and despair, perhaps we can all accept the challenge of moving to safe harbors; to become moored to a life of purpose.